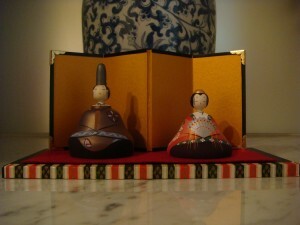 Hina Matsuri-A Day For Girls – Life! 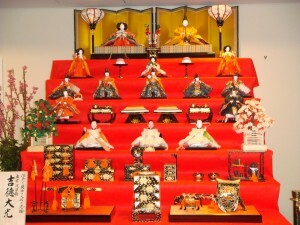 The display can have up to seven tiers arranged with dolls and furniture. The top tier always has the emperor and empress displayed with a gilded screen behind them. 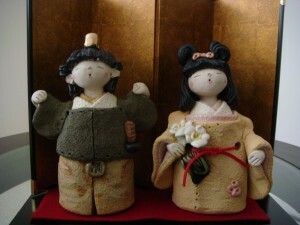 Most families display their dolls beginning in mid-February and put them away immediately after Hina Matsuri is over. They believe that families who are slow to put away their dolls will have a hard time marrying off their daughters. It’s the small set I have been looking for. They are made of wood and I love the hand painted detail. The tiny emperor is just 4 inches tall and the empress is just 3 inches. I also felt good helping this new little shop. Last Monday, when I returned from the US I had a beautiful gift waiting for me. My French friends Frederic, Karine, Zoe and Aimie gave me this set as a thank you gift for keeping Zoe while Karine was in the hospital giving birth to Aimie. It was totally unexpected, but very much appreciated. It is so beautiful and unique. I have never seen a set like this. It’s such a wonderful gift and it will always remind me of wonderful friends and the fun that I had with my little friend Zoe. There are special treats on Girl’s Day. Shops stock feminine looking sweets in pastel colors. Yesterday, I decided to try some traditional Japanese sweets. They are delicate pink pancakes filled with red bean paste, rolled and wrapped in a leaf that has bean soaked in something slightly salty. 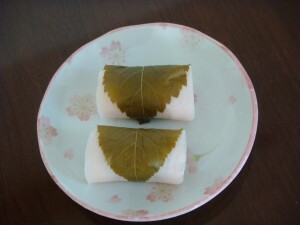 The salty taste was a nice contrast to the sweet red bean paste. Very beautiful dolls – all of them! Thanks for sharing the story. p/s just read your cupcakes thread too – the photos sure made me hungry! I love the dolls, (lucky me, we were with you for your purchase, CUTE STORE!! What a fun gift to receive! You babushka you!